Real Madrid and Germany midfielder Toni Kroos has signed a contract extension with Real Madrid, which will keep him at the Bernabeu until June 2022. The German midfielder has committed his long term future to Real Madrid, and is expected to become the highest paid German player in the world. Kroos joined Real Madrid in 2014 after the Spanish side agreed to a €30 million transfer fee with Bayern Munich. He initially signed a 6-year contract with the club. 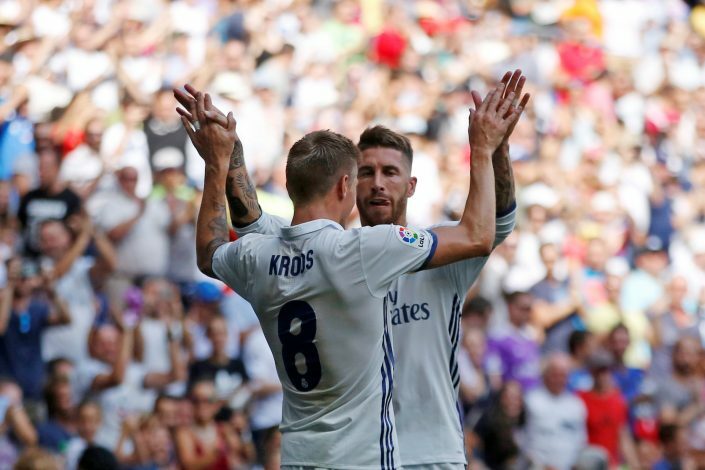 Kroos has so far played over 100 matches for Real over the past 3 seasons, and helped the club win the UEFA Champions League last season. He was also an integral member of Germany’s 2014 FIFA World Cup triumph. The midfielder was linked with a variety of high-profile clubs last summer, including Manchester United and Manchester City. Real Madrid have now made a big statement in offering the player a new contract. Real Madrid announced that both the player and the club had come to an agreement over a new deal earlier today. The news was first broadcasted on the club’s official website and Twitter page. The statement also went on to reveal that the player will have a media session tomorrow at the Bernabeu Stadium. Newspapers in Germany report that Kroos’ new contract will earn him at least €20 million a year, which means that he would be highest paid member of the Germany national team. Reports from Spain claim that Real Madrid are also in the process of preparing mega contracts for Cristiano Ronaldo and Gareth Bale.